Austria - Kennelbach - October 2008 - HEAD player Andy Murray captured his second successive Masters Series title against HEAD player Gilles Simon and a stunning upset over World No. 2 Roger Federer at the Mutua Madrilena Masters in Madrid. Murray played a hard-fought match against Simon in the finals eventually winning in straight sets 6-4, 7-6(6). On his way to the finals, Murray, who plays with a MicroGEL Radical MP, stunned World No. 2 Roger Federer 3-6, 6-3, 7-5 to earn his third career victory against his opponent. 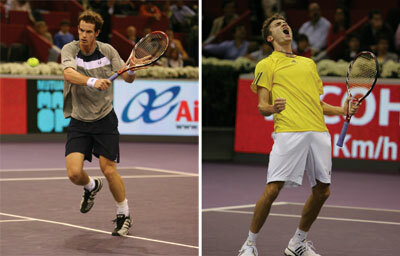 Despite losing to Murray in the finals, fellow HEAD player Gilles Simon enjoyed a successful weekend upsetting World No. 1 Rafael Nadal in a close quarterfinals match 3-6, 7-5, 7-6(6). Simon, who plays with a MicroGEL Prestige MP, also defeated HEAD player Ivo Karlovic, who bested World No. 3 Novak Djokovic the round before, to advance to the quarterfinals. While Murray is already qualified as No. 4 seed at the upcoming Tennis Masters Cup in Shanghai, Simon has climbed to No. 9 in the ATP race and has a still a good chance to reach a spot among the Top 8 players to attend the Masters Cup as well. In doubles competition, HEAD player Mark Knowles, who plays with a MicroGEL Prestige MP, reached the finals with his partner Mahesh Bhupathi losing a close match against his competition 7-5, 7-6(14). At the WTA women’s competition in Zurich, HEAD player Anabel Madina Garrigues, who plays with a MicroGEL Extreme, reached the semifinals while HEAD player Patty Schnyder lost a close doubles match in the final round.